The Red Line is one of the two lines on the Dubai Metro network in Dubai, United Arab Emirates. The first section was inaugurated on 9 September 2009. Construction was declared complete on 28 April 2010. The line has 29 stations spanning 52.1 km (32.4 mi), which have been opened in phases from 2009 to 2011. It runs from Al Rashidiya to Jebel Ali and travels along Sheikh Zayed Road for most of its length. 9 September 2009: Rashidiya-Nakheel Harbor & Tower (intermediate stations Airport Terminal 3, City Centre, Al Rigga, Union Square, Khalid Bin Al Waleed, Al Jaffiliya, Financial Centre, Mall of the Emirates) opened in a massive ceremony, and unveiled to the public the following day. 4 January 2010: Burj Khalifa/Dubai Mall station opened to the public on same day as inauguration of Burj Khalifa. 30 April 2010: Emirates Airline Station, Airport Terminal 1 Station, Al Karama Station, Emirates Towers Station, TECOM Station, Dubai Marina Station and Ibn Batutta Mall Station opened to passengers. 15 May 2010: Al Quoz (Noor Islamic Bank) Station, World Trade Center Station and GGICO (Al Garhoud) Station opened to commuters. 15 October 2010: Business Bay, First Gulf Bank (Burj Al Arab), Sharaf DG (Al Barsha), Nakheel (Emirates Golf Club) and Jumeirah Lake Towers Stations opened to public. 11 March 2011: Jebel Ali/JAFZA Terminus Station opened to the public. 11 December 2012: Danube/Jebel Ali Industrial Station opened to the public. 30 September 2013: Energy Station opened to the public. The Red Line has 29 stations, including 24 elevated (by means of a viaduct), four underground stations, and one at ground level. The line is 52.1 km (32.4 mi) long, with 4.7 km (2.9 mi) underground. The entire journey time on the Red Line is around 60 minutes, traveling at a maximum speed of 110 kilometres per hour (68 mph), with 20–30 seconds stopping time at each station. The average time between stations on the Red Line will be 60–90 seconds. 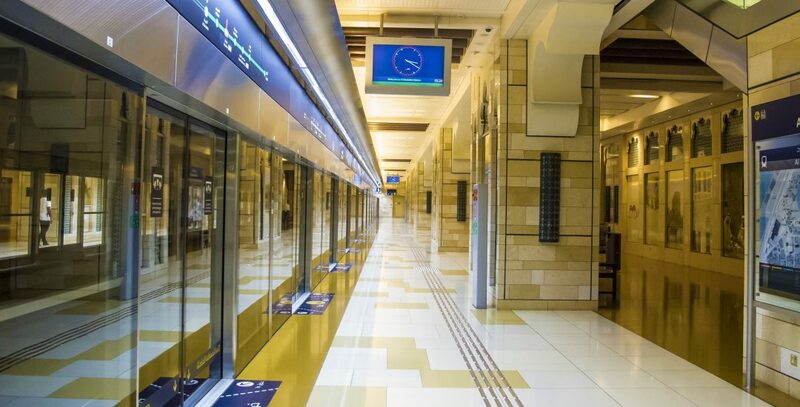 The RTA operates 27 trains in the morning peak hours and 29 trains in the evening peak hours with the interval between train services ranging from 6 to 8 minutes in the morning peak period, and from 5 to 6 minutes in the evening peak period. In 2013 the Red line metro lifted a total of 88.888 million passengers and the current daily average is about 243,000 people as of 2013, according to the RTA Statistics Office. 170 feeder buses provided by the RTA for commuters to commute to stations on the red line are also in operation as of 15 October 2010. Two transfer stations are designated, Union and BurJuman (formerly Khalid Bin Al Waleed) stations, where the Green and Red Lines intersect, allowing passengers to change between lines. The Red Line has a main depot in Al Rashidiya and one auxiliary depot at Jebel Ali Free Zone. An extension of the Red Line to the Expo 2020 site was announced in December 2015. The extension project, named “Route 2020” will create a branch of the line from Nakheel Harbour & Tower to the Expo 2020 site, near Al Maktoum International Airport. Nakheel Harbour & Tower Station is to be reconfigured to allow trains to operate on the new part of the line. The 14.5km extension will pass through Discovery Gardens, Dubai Investment Park, Al Furjan and Jumeirah Golf Estates and will have 8 new stations; 6 elevated and 2 underground. As a result of increasing popularity of the Metro, the newly built stations will have platforms wider than those found in current stations, to cope with greater ridership. The extension is expected to be completed in 2018. A second extension from Rashidiya to Mirdif is also proposed. On 13 May 2010, The Roads and Transport Authority (RTA) announced that the Al Quoz metro station, which opened on 15 May, would instead be called Noor Islamic Bank Station. This latest announcement that Noor Islamic Bank has won the right to name Al Quoz Station for a period of ten years was made in the presence of the bank’s representatives at the RTA headquarters in Dubai. The naming initiative has so far generated Dh2 billion in revenue for the RTA. On average, each station has brought in Dh90-100 million. As many as 21 stations on both Red and Green Lines have already been named after local and international corporate giants, including Etisalat, Emirates Airlines, GGICO, Nakheel, Sharaf DG, First Gulf Bank andDanube for Jebel Ali Industrial Station. Noor Islamic Bank is the latest to join the pantheon. On 28 June 2015, Jebel Ali station was renamed UAE Exchange. The station was the 16th company to join the Roads and Transport Authority’s (RTA) station rebranding programme.